Colorado Democratic Sens. 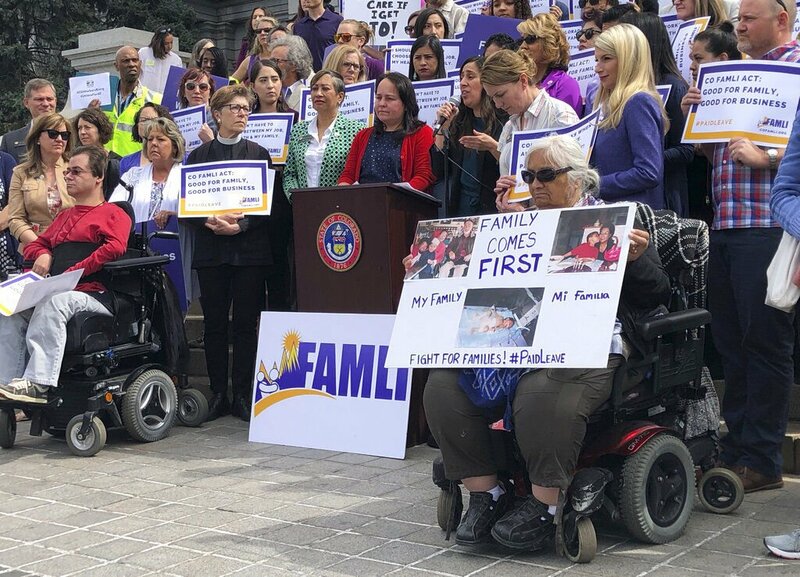 Angela Williams and Faith Winter listen behind the podium as activist Judith Marquez speaks in favor of their paid family leave bill at a rally outside the statehouse on April 9 in Denver. State Sen. Jessie Danielson, D-Wheat Ridge, holds her daughter, Isabelle, at a noontime rally at the state Capitol in favor of a bill to create a paid leave insurance program so workers can take time off with income for an illness or to take care of a loved one. A Colorado Senate committee on Tuesday advanced an ambitious paid family leave bill that was substantially amended by its sponsors in an attempt to alleviate the concerns of most of the state's major business chambers. The Senate Finance Committee voted 4-3 Tuesday to send the bill to the Appropriations Committee. The vote came after Sens. Faith Winter and Angela Williams, the bill's Senate sponsors, offered a series of amendments, including an option allowing private employers to opt out of the program. She and Winter told a rally outside the statehouse before Tuesday's hearing that the bill will allow mothers to nurture their newborns and cancer patients to keep up with chemotherapy without financial pressure to get back to work. "Yes, there's a cost to this policy — but there's also a cost to not doing anything," Winter said. "I did not say this appeases the business community. They are opposed and remain opposed," Winter said.